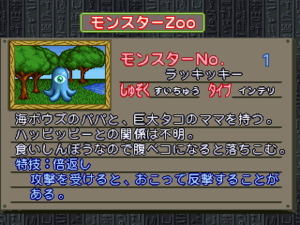 An example monster information screen from the game. This is "Luckicky", monster number 1. This is a list of monsters in Yu-Gi-Oh! Monster Capsule: Breed and Battle. There are 103 monsters featured in the game, many of which have never appeared in any other Yu-Gi-Oh!-related media. A gallery of monsters can also be viewed. "The Rumored Capmon's New Appearance"
"Capmon King! The Decisive Battle"
This page was last edited on 17 January 2019, at 18:04.